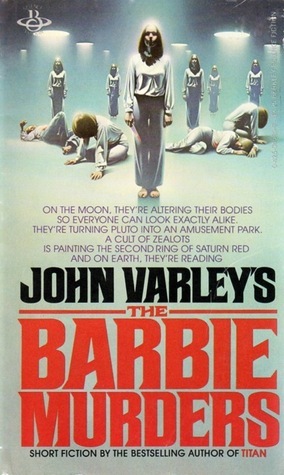 For those of you familiar with his work, John Varley is a not-terribly-prolific writer of old-school science fiction novels and stories in the grand tradition of Heinlein, Asimov, and other post-war authors. His career stretches back to the mid-seventies, and my acquaintance with his work goes back nearly that far. I can remember begging my parents to buy me mass market editions of his work at Crown Books in UTC, back when I was still a young nipper and there was no such thing as Borders or Amazon.com. I incurred the wrath of my junior high teachers by reading Varley’s Gaean Trilogy (Titan, Wizard, & Demon) during classes. It did not help that, because of poor eyesight, I always sat in the front row. Regardless, I’ve carted those three books around with me from place to place, from junior high through graduate school, from shared apartments to a home of my own, for the best part of thirty years. One of my favorite Varley characters is Anna-Louise Bach, a police officer on Luna, the heavily colonized moon of the future. (I told you I liked weird police procedurals.) Bach featured in a series of stories that took her from rookie beat cop all the way to chief of police. Two of the best were ‘The Barbie Murders,’ which involved a homicide within a cult with genderless, virtually identical members, and ‘Bagatelle.’ Though I haven’t read either of these stories in years, I was pleased to see the complete text of ‘Bagatelle’ pop up on the Subterranean Press website as a teaser for their upcoming Varley collection Goodbye Robinson Caruso and Other Stories. You can read it there for free. In the opening scene of ‘Bagatelle,’ a mobile, talking nuclear bomb rolls down a crowded shopping tunnel of New Dresden, Luna, saying things like “I will explode in four hours, five minutes, and seventeen seconds” and “I am rated at fifty kilotons.” Chief Bach commandeers the services of Roger Birkson, a Terran expert in disarming nuclear I.E.D.s, interrupting his round of golf at a nearby resort. It transpires that the talking bomb contains the brain of an actual human being who, for obscure philosophical reasons, has allowed himself to be engineered into this weapon of mass destruction. If all of this suggests a bleak sort of comedy to you, you’re not far off. Certain scenes in which Bach–half naked in clothing-optional Luna–and the golf-togged Birkson interrogate the bomb have a Monty Python edge of weird hilarity. But Varley doesn’t let the reader forget the terror of the situation for long. We feel Bach’s stress as Birkson’s behavior becomes more and more bizarre. We see the reactions of her junior offers–one of whom is pregnant–as they throw up or pass out from unendurable tension. Although New Desden is saved, the way the story ends leaves a hollow pit of horror in the stomach. ‘Bagatelle’ was originally published in 1974, during the Cold War, when nuclear immolation seemed both inevitable and imminent. It’s a fear I remember well and can’t say that I miss, the poisonous background radiation of my childhood and adolescence. The nuclear terrorism Varley envisions here has not yet come to pass. So far as the general public knows, no sub-national cadre of ideological nut-jobs has succeeded in assembling a nuclear bomb. But no one would deny that it could happen. Like the Cold War itself, it’s just something that we live with. For those of you not up on your French, in addition to being a rather ridiculous pub game, a bagatelle is a task of little importance or one that is easily accomplished. Indeed, Varley makes it look easy here, with a story that is readable, entertaining, and still relevant twenty-nine years down the road. John Varley is a writer who all fans of science fiction should get to know, and I can think of no better place to start.